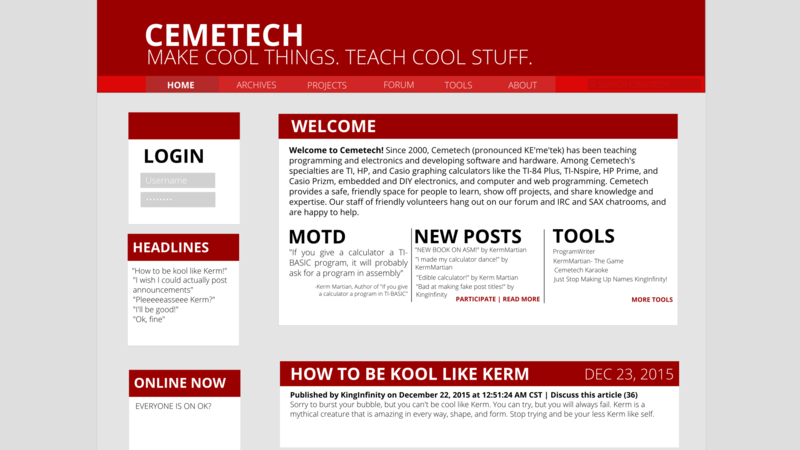 Do you think Cemetech needs a theme upgrade for 2016? No, and this does not look good. I thought by removing some gradients and rounded edges we could make it look more, 2016? Anyway, I made a little mockup, but it's not perfect- I created it tonight while on vacation on a MacBook without a mouse or extended keyboard. Feel free to post your own ideas and mockups as well! Admins, if you see this, please edit the poll and change it to "Which one do you like better? Options: Red, Dark Red, or Blue, Another color would look better, and I don't like it"
Finally, a lot of people have said they do not like the red, and I must say, I somewhat agree. I didn't even notice until I realized you didn't change the date on the last announcement, despite being totally different from ticalc's. Also, the rest of the announcements are the same, and they almost passed as being Cemetech's o_O. Joking aside, I did know it was TI-Calc, but I immediately thought of that old april fools merger (1/2) joke. Anyways, that design looks really good. Hopefully we can move to a flatter theme soon. So, I picked that Cemetech definitely needs a new theme and this is almost it. I think Cemetech may use some contrast color, for example when I accidentally put it on night mode on my phone there was suddenly blue in it and I simply loved it! 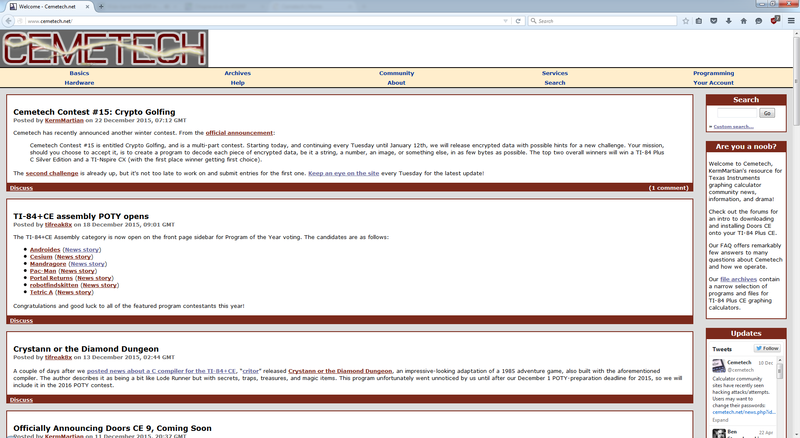 I think that for example the United TI archives look best with the theme that we have right now. But that's up to Kerm and his admin and mod Team, they should decide! I really like this. I'm sure "LOGIN" can be in the read banner above the box. 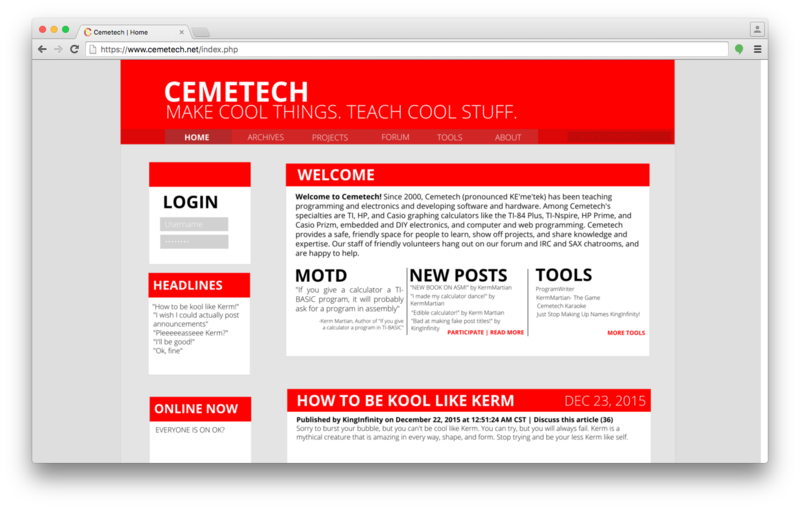 We've been planning Cemetech7 for a while and it's how we ended up with Cemetech6.5 because none of us had time to put in the effort for a full fledged redesign but everyone realized we needed to at least make the template modern (read: responsive). C7 is still likely a ways off but when the discussion picks up again I'll definitely advocate for this style. I added a blue design above, as many users have said the red assaults their eyes. I must say, I agree. 3) I think although DJomni would disagree, that the new programs section on the home page should be readded, because I personally liked looking at people's new stuff and what they were up to because not everyone posts a topic every time they upload a program. 5) I just noticed this, but why is Ticalc not a partner of Cemetech, is there some kind of stigma between Cemetech and Ticalc? Not at all, they were going to merge back in '09 but it fell through. Some say it was real, although Cemetech and TiCalc said it was a joke. For what it's worth, Red is the distinguished Cemetech color in the community. Blue is Omnimaga. The deep red that you did the second time is more inline with the Cemetech Red. Anyways, it's incredibly unlikely that we would switch to a new color for the next template. Though, we could allow the users to select a color template, which again is unlikely. I think the current theme does the job pretty fine. It's not even a year old either. The only gripe I have about it is that on mobile we can't see post dates in the topic and message list and the recent file downloads list is gone. As eye-catching as that top red mockup looks to me, it feels more Sparkfun than Cemetech to me. As comic said, the maroon one feels more in line with the Cemetech aesthetics. 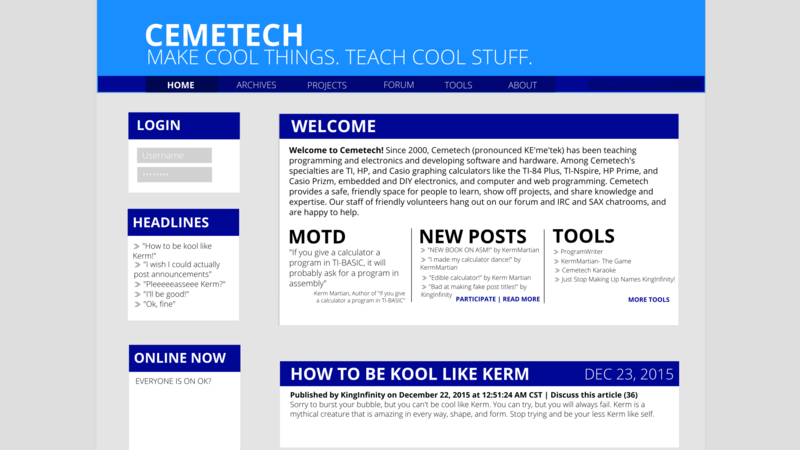 With that said, although Cemetech6 is a pretty old theme at this point, and the Cemetech6.5 upgrades only really changed the layout of topics (and made the site responsive for mobile viewing), I'm not sure that we're at the point where we have a dire need for a new template. Part of the problem is that none of our staff has the time to devote to developing, testing, and rolling out a brand new template. We have long-standing plans for a new site engine, including forum, templating, news, and archives, but lack of time has consistently stopped us from making any forward progress on it. I think our limited time is unfortunately best spent maintaining and improving the current site for now. I love the way you're thinking, though, and perhaps we need to see some more detail in those mockups to give us some ideas for how to improve the current theme! ticalc.org lists us in their "other sites" section, but I should indeed talk to Travis about whether some kind of official partnership might be in our mutual best interest. I feel like we've always had a very good relationship with them. About the header, I'd take the old logo and give it some new touch. Maybe link the current "Make Cool Things, Teach Cool Stuff" text to the logo. Although the theme update might not be relevant at this time, I'll keep throwing in some ideas for the future. By all means, you guys are welcome to brainstorm. I'm loving everything I'm seeing. Speaking unofficially here, help from the community is always a good thing and may give us, the Cemetech Community not just the admins, the push to finish Cemetech 7. © Copyright 2000-2019 Cemetech & Christopher Mitchell :: Page Execution Time: 0.245919 seconds.